Sam McEntee celebrated his 20th birthday a few days early today at the Penn State National Invitational by crushing the 4:00 barrier in the mile. 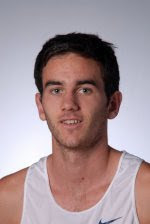 In only his fourth mile race ever, McEntee, a sophomore from Perth, Australia, finished third in the invitational mile, in 3:57.86. That is an NCAA nationals automatic qualifier for McEntee. He is Villanova's 29th sub-4:00 miler and -- along with Matt Gibney -- the second Villanova runner from Australia to break that magical 4:00 barrier in the last 11 months.